The following provides answers to many common questions for the Fingerprint Mouse. Please read this section before contacting us directly. If you have a question about something that is not covered here, please send us an email and your question might just end up on this page. 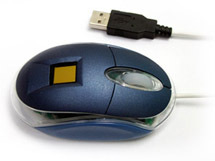 Q: What is the difference between the optical sensor mouse and the IC sensor mouse? A: The differences between the two sensor technologies are described in the general biometric fingerprint section on this website.